Antonio Lennert, the chief experience officer of Surf the Greats, looks out over the waters off Bluffer’s Park where he spent several hours surfing on Wednesday. When the waves are good, this spot in Scarborough will see scores of surfers paddling out to catch the waves. 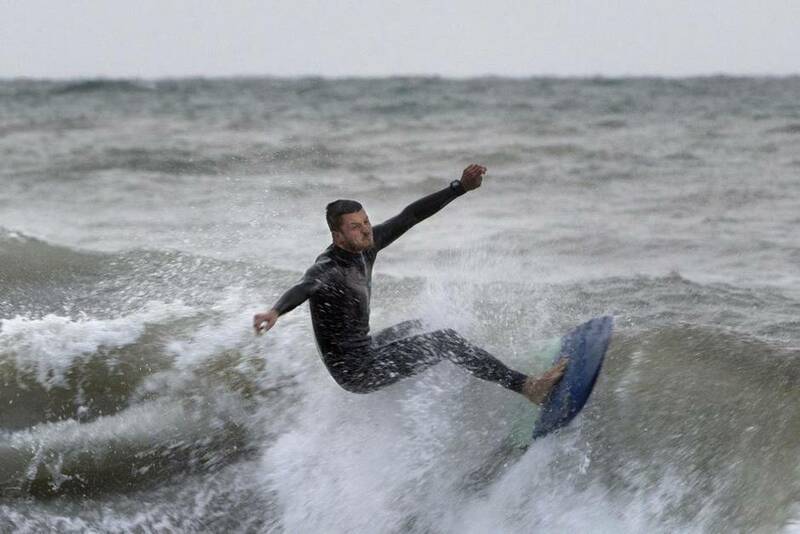 Though summer has ended, Ontario's lake-surfing community is just gearing up for ideal conditions now that the weather is getting "worse." The popularity of cold-water surfing has grown with improving wetsuit technology and as warmer, traditional surf spots become more crowded. The Globe and Mail spoke with Antonio Lennert, chief experience officer of Surf the Greats, a surf school, retailer and community hub in Toronto's east end. Lennert, originally from Brazil, says Toronto's most oceanic spots are Woodbine Beach/Ashbridge's Bay Park and the Scarborough Bluffs. How did you get involved in Toronto's surf scene? I came around in the scene about four years ago, when lake surfing was just starting to open up. People have been surfing here since the 1960s, but it hasn't been very popularized. In the past five to 10 years, there were a few people who started to make it more accessible. I'm a graphic designer, I used to own a design firm. I never envisioned owning a surf company. I surfed my whole life in Brazil, California and Australia. In Ontario, I started seeing a lot of people putting themselves in really dangerous situations because they did not have access to surf education or even the proper tools to do it. I went down to Costa Rica, did a surf rescue course as well as training to be a surf instructor. I came back to the lakes with the goal to nurture, grow the community, educate and provide people with the tools to practise the sport safely. The popularity of cold-water surfing has grown with improving wetsuit technology and as warmer, traditional surf spots become more crowded. How does this compare to surfing in Brazil? It's a challenge, not going to lie. It's a lot easier to put on a bikini or board shorts and just paddle out when it's nice and warm. For me, I'm just so grateful to live in such an amazing country with so much opportunity. To have the opportunity to surf here, even if it's not ideal conditions, I think there is an overall feeling of gratitude. We don't take it for granted. At Surf the Greats, we always teach people there are no bad days – just be happy that we can do this. Ontario fall and winters are cold, with conditions that are not traditional or ideal. Why do you surf then? It's because of our love for surfing. If you have surfed before and you've been bitten by the bug, you know if there's waves where you live, and you'll find a way to surf it. For us, when it's windy, rainy or snowing, most people choose to read a book on the couch, we choose to paddle out and catch some waves. Starting in the fall, it's not bad because the air and water are still fairly warm, you can ease yourself into winter. As it gets colder you can decide to take the winter off and start again in March, but most people just keep going. My mom has always told me that no great thing comes without a little adversity. I think that really applies here. Surf the Greats is a surf school, retailer and community hub in Toronto’s east end. What are conditions like in the middle of the winter? It's cold when you stand on the beach, but you can stay out on the water for two, three hours easily. Once it goes below freezing, that's when things get a bit more challenging. The water usually hovers at 2 or 3 degrees, but every part of you that is exposed in the air, because you are wet, starts to freeze. Especially if it's minus-15 or 20, after an hour or so, you start to create icicles around your face or ice will start to attach to your beard. We usually keep surfing. It does get a little bit heavier, we're all pretty used to it. The biggest challenge is that the only way to get out of your wetsuit is to thaw it out. We usually hop in our cars, turn on the heater, drink some tea or hot water and just wait for it to melt. It's kind of crazy. How does someone start to learn to surf here now? You need a wetsuit. The water temperature is cold year-round. You need a surfboard. It could be a bodyboard, a longboard, a shortboard, but if you ride a shortboard it needs to be a bit thicker and wider because we don't have salt here and you need a bit more flotation to catch those waves. As it gets colder, you need rubber booties, mittens, tuque to protect your head and keep you warm. If you've already surfed before we'd be happy to tell you where and when to go. There are a few Facebook groups people can go to, such as the Toronto Surf Club. Just seek out the community, it will naturally happen.